I have been researching Texans who may have been involved in the assassination for quite some time. I attempted to paste a recent blog post but was unable to do so because it contains too many images. in order to see the excerpts from various news articles, journals and other sources, as well as other posts on the same blog. In 1944 Bedford Shelmire Wynne married Juanita Jean Love, the daughter of T. Stafford Love, a medical doctor. Her grandfather (Thomas Bell Love) had been an attorney, insurance executive and a Democratic politician and bureaucrat in Dallas until his death in 1948, with an office (in the 1940s) at 1922 Republic Bank Building while residing in the Argyle Apartments at 3212 Oak Lawn. Dr. Love's office was in the Medical Arts Building and at 4239 Prescott Ave., while living at the south side of Cochran Chapel Road at Midway, a short distance east of Dallas' Love Field. The marriage between Bedford and Nita lasted until 1971, when they divorced. She was a member of Highland Park United Methodist Church in Dallas when she died in 2006. Paternal Grandfather of Juanita Jean Love (Mrs. Bedford S. Wynne, 1943)Thomas Bell Love (1870-1948), lawyer and Democratic politician, the son of Thomas Calvin and Sarah Jane (Rodgers) Love, was born in Webster County, Missouri, on June 23, 1870. He graduated with a B.S. degree from Drury College in Springfield, Missouri, in 1891. He was married to Mattie Roberta Goode on June 11, 1892, and they had three children. Before moving to Dallas in 1899, he was city attorney of Springfield, Missouri (1892-94), a member of the board of managers of Missouri State Hospital, and secretary of the Democratic State Central Committee of Missouri (1896-98). Love was a prominent figure in Texas political life for the first three decades of the twentieth century. He was elected to the Texas House of Representatives from Dallas County in 1902, 1904, and 1906; the last term he served as speaker of the House of Representatives. He was an expert on taxes, insurance, and banking and had an important role in the passage of the reform legislation of 1905 and 1907 related to these issues. At the conclusion of the 1907 legislative session, Governor Thomas Mitchell Campbell appointed him commissioner of the newly formed Department of Insurance and Banking. Love resigned from the office in 1910 to resume law practice in Dallas and to become associated with Southwestern Life Insurance Company and Western Indemnity Company. He did not retire from politics, however, for he was a leading spokesman for the prohibition forces in the 1911 submission campaign, and he was an early supporter of Woodrow Wilson for the Democratic nomination in 1912. In 1917 President Wilson appointed him assistant secretary of the Treasury Department and placed him in charge of the Bureau of War Risk Insurance. Returning to Texas in 1919, Love was elected national Democratic committeeman from Texas in 1920, and he served in that capacity until 1924. He was a leader of the anti-Ferguson forces in the gubernatorial campaign of that year. In 1928 he opposed the nomination of Alfred E. Smith and bolted the party during the election to help organize the Hoover-Democrat clubs that went into the Republican column that year. The last elected office he held was that of state senator (1927-31). Love died in Dallas on September 17, 1948. BIBLIOGRAPHY: Norman D. Brown, Hood, Bonnet, and Little Brown Jug: Texas Politics, 1921-1928 (College Station: Texas A&M University Press, 1984). Lewis L. Gould, Progressives and Prohibitionists: Texas Democrats in the Wilson Era (Austin: University of Texas Press, 1973; rpt., Austin: Texas State Historical Association, 1992). As we reported in a previous blog post, Bedford had attended in 1938 a very small private school in Dallas, the Texas Country Day School, which had been founded with only 10 students in 1934. One of the best recruiting devices for the school was the hiring as its football coach then-famous Heisman-Trophy winner and All-America football star from Texas Christian University in Fort Worth, Davey O'Brien, who had graduated from Dallas' Woodrow Wilson High School in 1932. As Barr McClellan mentions in his book, Blood, Money & Power, among Davey's fellow students during the 1930s were Congressman Jim Collins and Malcolm (Mac) Wallace. Robert Gerald Storey (1893-1981) was a Colonel in the U.S. Air Force during World War II and was Executive Trial Counsel for the United States at the Nuremberg Trial of major Axis War Criminals. He personally interrogated Rudoph Hess, Hitler's Deputy and Nazi Party Leader. In 1947, Mr Storey founded the Southwestern Legal Foundation, serving as President (without compensation) from 1947 to 1972. He served as Dean of SMU School of Law from 1947 to 1959, President of the American Bar Association 1952-1953, President of the Inter-American Bar Association 1954-1956, Member of the Commission to Reorganize Executive Branch of U.S. Government (Hoover Commission) 1953-1955, Member and Chairman, Board of Foreign Scholarships (Fulbright Commission) 1956-1962, and Vice Chairman, United States Civil Rights Commission 1957-1963. He served and received awards from numerous local, state, national and international organizations. In 1969 the World Peace Through Law Center presented him its World Lawyer Award in Bagkok, Thailand. It is very possible Bedford Wynne's father Angus G. Wynne, who was the first president of the State Bar of Texas (1939-40) knew Storey, who served in that same capacity (1948-49). Robert, Jr. died in 1962 at the tender age of 41. In 1964, however, the elder Robert G. Storey appeared with colleague Leon Jaworski and others to hear testimony of Dallas District Attorney Henry Wade concerning whether or not there was any evidence that Lee Oswald had been an informant. Elizabeth Anne Toline (daughter of Basil Irving Toline). 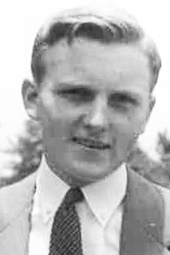 Toline, incredibly enough was from Moline (Rock Island) Illinois and was assistant sales manager for the farm implement company (John Deere) in 1930. Elizabeth had been born in Moline, IL in 1921. Once they moved to Dallas, B.I. Toline, as he was called, became president of the Dallas Agricultural Club. (images not pasted here; go to above link - http://quixoticjoust.blogspot.com/2011/06/connection-between-robert-g-storey-jr.html). asking about Oswald's "position"' before any "steps" were taken. A spokesman for the FBI said here that the letter was "being investigated" and declined to comment on any findings since it was received. He indicated the letter was obtained only recently. "Dear Mr. Hunt:"I would like information concerning my position. I am asking only for information. I am suggesting that we discuss the matter, fully before any steps are taken by me or anyone else. Thank you." A comparison of the handwritten note with samples of Oswald's handwriting led investigators to conclude that it was written by Oswald or someone who could imitate his handwriting. Oswald, according to the Warren Commission which investigated the assassination, fired the shots that killed Kennedy. Earlier this week published reports said a copy of the letter had been sent to a retired Texas newspaper editor, Penn Jones, at Midlothian. Tex., by an unidentified source in Mexico City. Jones said the source sent an accompanying letter explaining that he had given a copy of the letter to FBI director Clarence Kelly in 1977, but had received no response. Jones quoted the source as saying that because he had received no answer he was afraid something bad "might happen to me" and had decided to leave the country temporarily. Jones said he wrote to the address in Mexico City, but never heard from the man again. Oswald's widow, Marina, testified in 1964 before the Warren Commission that about two weeks before the assassination Oswald had mentioned he had found a job opening that would provide "more interesting work." John Stuart Hunt was born on July 6, 1921, and passed away on March 18, 2011. He was born in Miles City, Mont., to "Tot" and Sherman Hunt Sr. He arrived in Tyler at the age of 9. His brother, Sherman Jr., drove the entire distance from Montana to Texas at the age of 14 to meet with their father at the beginning of the East Texas Oil Boom. The family moved to Dallas in 1939. He attended Washington and Lee University for two years before returning to Texas to be close to home at the outbreak of World War II, and graduated from The University of Texas in 1942. He was a proud member of the United States Marine Air Corps. Upon his return to Dallas after active duty, he married Jeanne Gannon in 1946. He remarked that he would marry the love of his life after seeing her enter the ballroom of the Dallas Country Club, before he ever knew her name. His lengthy and colorful career ran the gamut of endeavors. He started in the oil industry, purchasing leases at the age of 18 after convincing a judge to remove his status as a minor. Stuart participated in the prosperity and growth of Dallas after World War II. He owned, operated or served on the boards of numerous corporations and businesses in banking, to insurance, ranching and real estate development. In looking over his 70 years as a businessman, his greatest personal achievement was the founding of Preston Trails Golf Club. He was the visionary behind the concept and the driving force to see it through to fruition. Preston Trails was opened in 1965 and is continually regarded as one of the most respected private golf clubs in the United States. Mr. Hunt's crowning recognition came about last year on the first tee box, upon the reopening of the golf course. He was honored as the last living founder of Preston Trails. A man of few words, he expressed humble appreciation for the spirit and camaraderie that has existed throughout the life of the club. He further stated that this "brotherhood" had exceeded his wildest dreams, and for this he was most grateful. He is survived by his three children, John Ward Hunt, Elizabeth Hara Hunt, Hilre Lucille Hunt; six grandchildren, Elizabeth Gannon Hunt, John Ward Hunt Jr., Andrew Stuart Hunt, Margaret Camille Hunt, William Kent Hunt, Henry William Frost V; one great-grandchild, Beau Turner Jr.; two nephews, Clay McLean Hunt and Todd McLean Hunt, sons of the late Mary and [his brother] Sherman Hunt Jr.
Ted Dealey Steps Up to Dallas News Board ChairmanMARCH 17, 1960 DALLAS (AP) — E. M. (Ted) Dealey has stepped up to become chairman of the board and publisher of the Dallas Morning News. 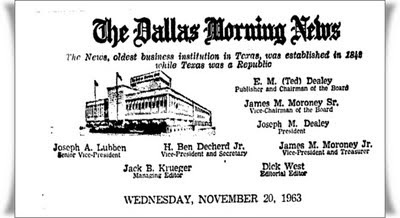 Joseph M. Dealey succeeded his father as president of The News and its associated enterprises, WFAA television and radio. The announcement Tuesday by the board of directors of A. H. Belo Corp., formal name of the company, also said that Managing Editor Jack Krueger, formerly of The Associated Press, had been named one of three new directors. The board elevated James M. Moroney Sr. from senior vice president to vice chairman of the board; elected Ben H. Decherd Jr. and James M. Moroney Jr. to vice presidents, and elevated Joe Lubben from vice president to senior vice president. Other than Krueger, the new directors named include A. Earl Cullum Jr., prominent in radio and television engineering; D. Gordon Rupe, a leader in investment banking and civic affairs, and Sol M. Katz, circulation manager of The News. The man whose wedding rehearsal dinner would be hosted by his uncle, oil millionaire H.L. Hunt, lived in the same fraternity house at the University of Texas with James M. Moroney, Jr., whose father had long worked with the Dealey family at the Dallas Morning News.